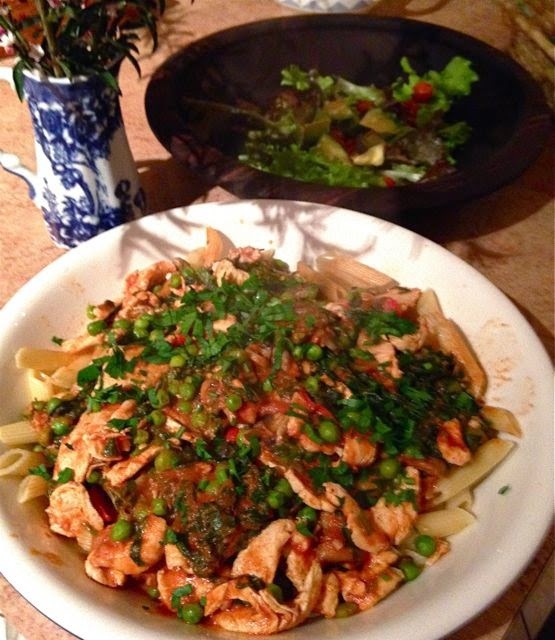 Short of time, cash, patience and ideas for dinner – then this is the dish for you. The ingredients are simple and cheap; cooking time is as long as it takes to boil some pasta; it ticks all the boxes for nutritional content; adults and children alike love it AND it’s delicious. I’ve called it Chicken Cucina, but I’m sure the Italians must have thought of it first and have a traditional name for it – please let me know if it rings a bell. 1. Cook pasta in boiling salted water until al dente then strain; steam the broccoli above the cooking pasta water until just cooked then refresh under cold water and set aside. 2. Heat oil in large heavy based pan. NOTE: This is important: if you use a small pan the chicken and mushrooms will become soggy in their juices and not take on those lovely stir-fried flavours, instead they will be more like a stew. 3. Flash fry chicken until the strips take on some golden colour – don’t overcook. 5. Add the tomato passata (wine) and cream and turn heat down to gentle simmer. 6. Add broccoli and season with salt and pepper to taste. NOTE: Marjoram is one of my favourite herbs for all kinds of Italian cooking; it has a lovely aromatic sweet nutmeg smell and flavour. If you don’t have it fresh then use basil and a pinch of freshly grated nutmeg. DONE! Now just toss the sauce through the cooked pene and top with a little fresh parsley and some freshly grated parmesan cheese. As you can see, this dish is very adaptable – I just leave the chillis and mushrooms out if I have any little ones for dinner – not their favourite things. 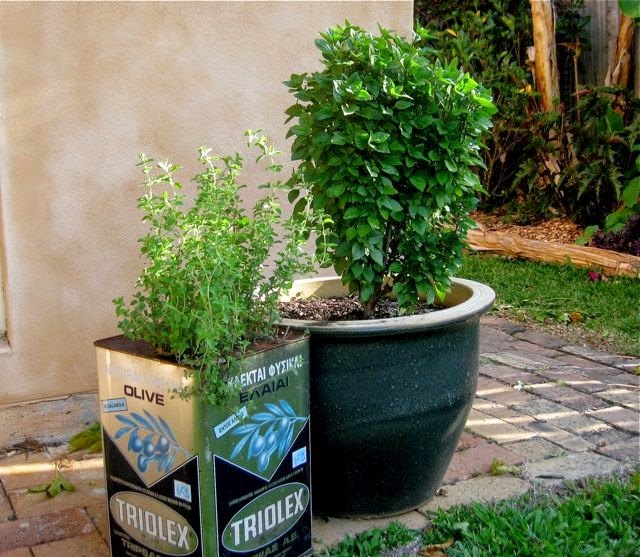 Marjoram (Origanum marjorana), often confused with oregano (Origanum vulgare), shown in the photo above growing alongside a pot of bush basil (Ocimum minimum); all easy to grow in a warm climate. Marjoram is more often used fresh in cooking and oregano dried or part of a marinade. I like to have them in pots close to the house and move them around when it gets too wet or too hot. 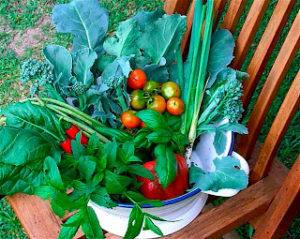 NOTE: Adding a handful of fresh herbs to any meal infinitely adds to it’s nutritional value. See previous post all about parsley.